Sometimes big changes happen right under our eyes and we barely notice, until one day we look at the same thing we’ve been looking at every day and suddenly realize how different it has become. The example of Netflix and Disney is a perfect example. For more than a few years now, there has been constant speculation that Disney would buy Netflix. Five years ago, that would have been an easily digestible acquisition for Disney when its market cap was 10x the market cap of Netflix. Even two years ago, when Disney was four times the size of Netflix, they could have gotten it done. Nowadays, it looks like that opportunity has passed. 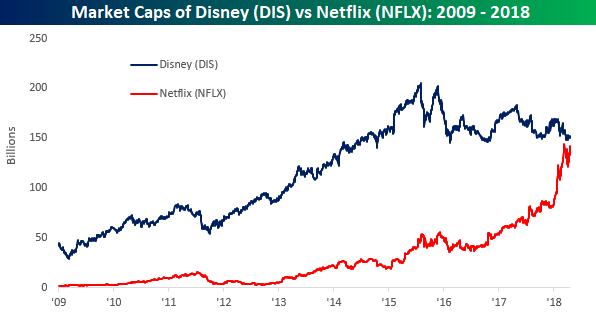 With Netflix opening higher by about 7% this morning, the stock will have a market cap of over $142 billion compared to Disney’s market cap of $152 billion. As shown in the chart below, the market caps of the two stocks have never been closer than they are now. How Concerning Are These 7 Bad Signs For Stocks?